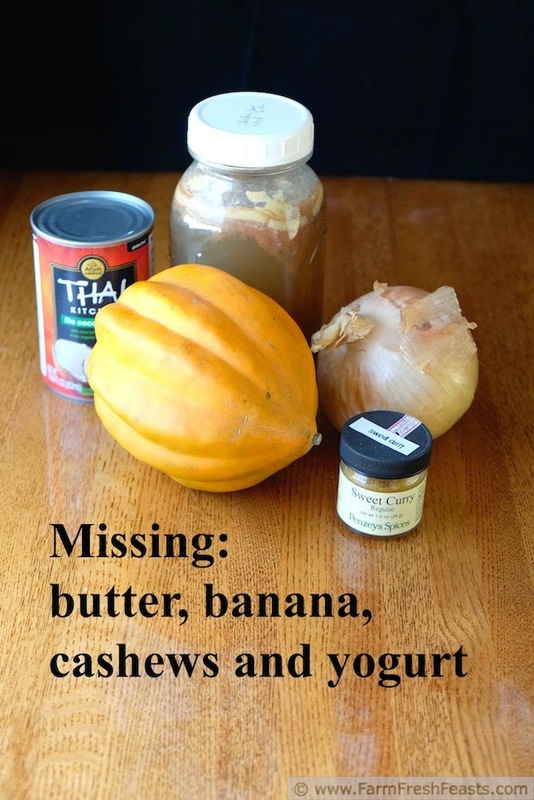 A warming winter squash soup spiced with curry, sweetened with banana, and luscious with coconut milk. This soup could be vegetarian depending on your stock choice. On a quest to add vegetables to as many recipes as I can--to utilize the produce from the Community Supported Agriculture (CSA) farm share before it spoils--I end up cooking most every day. That often means that we have a variety of leftovers available. 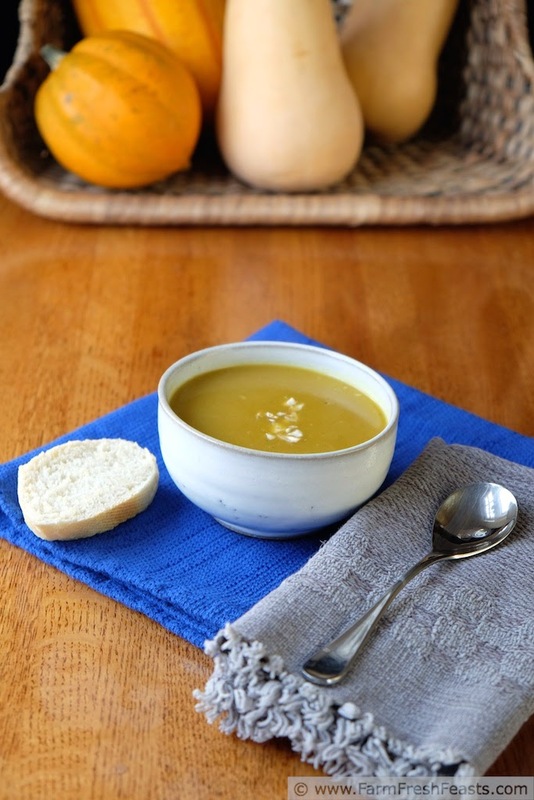 Sometimes, making a simple dish like this soup is a great way to dress up a dinner of leftovers. If you've read this blog before [thank you!] you may have . . . um, not exactly heard but how 'bout heard inside your head . . . me talk about how I put up carrot peels, celery leaves, onion skins etc into Soup Packs (link to my Frugal Eco Farm Fresh Feasting post). 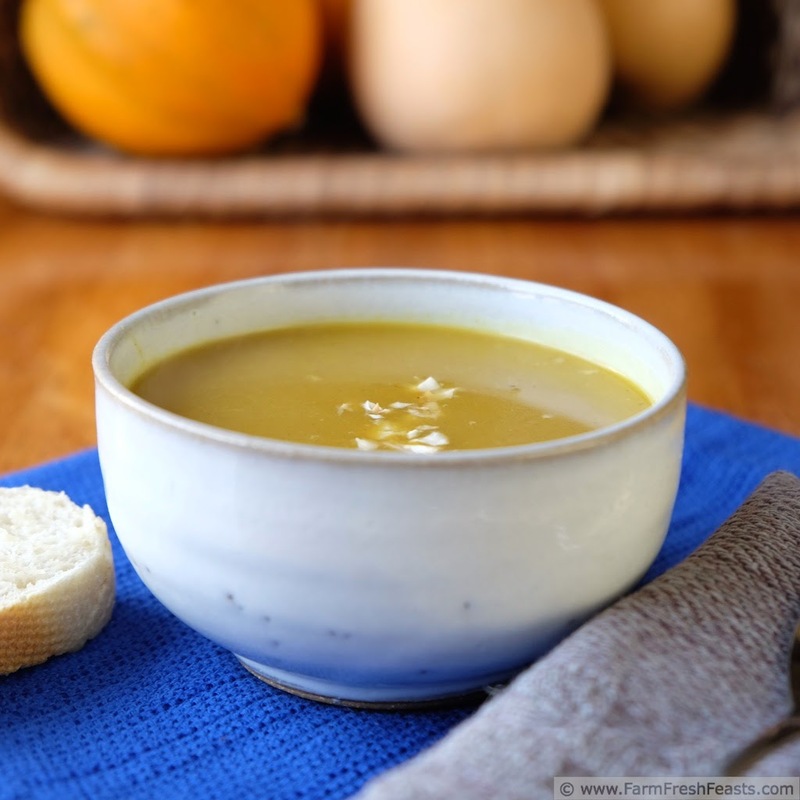 I've shared recipes for how I make Chicken Stock, Beef Stock, and Vegetable Stock. I've also shared how I put up pumpkin puree. Hey, guess what? Putting up acorn squash is no different! When I have the oven on--and I am thinking on all cylinders--I will roast an extra squash and save the puree for another use. If I've got a jar of stock, a container of roasted squash puree, and a ripe banana in the freezer this soup almost makes itself. I just need to chop and sauté an onion [but I'm teaching my son to master onion chopping, so I didn't even do that step]. I know it may seem strange to use banana in a savory recipe, even though I've done it before in my Ham and Banana Pizza. I've also combined squash and banana in muffins--which will appear sometime this Fall on a coming Muffin Monday--but this is not as sweet of a soup as those muffins. 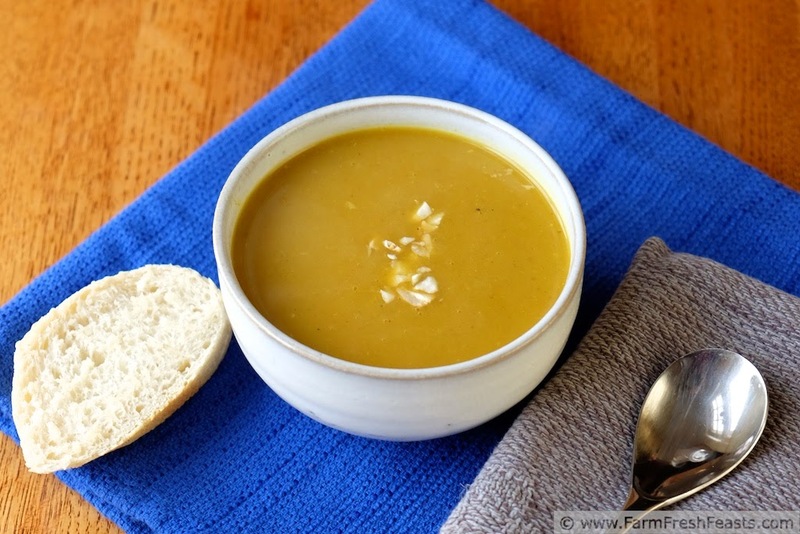 This is a savory soup with a hint of sweetness and a nice amount of spice. With an immersion blender this comes together quickly and makes a nice, warm, first course for a cold weather meal. 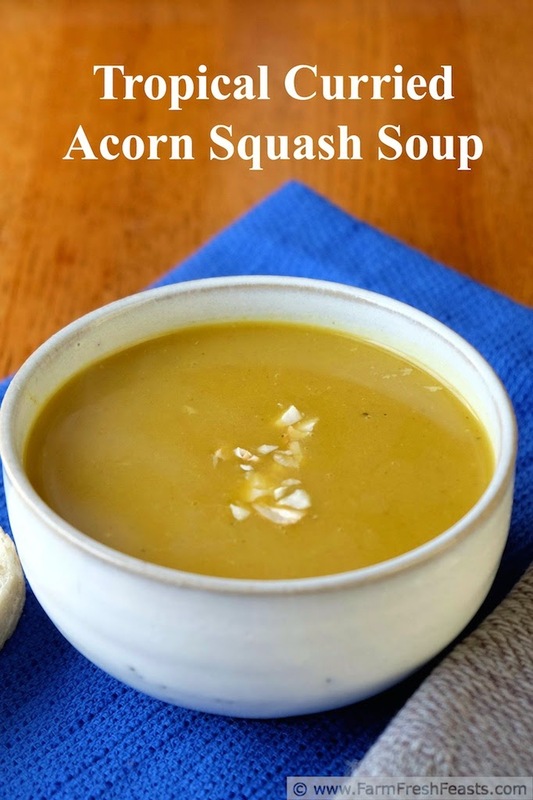 For other recipes using acorn squash, please check out my Acorn Squash Recipe Collection. For other recipes using ripe bananas, please check out my Banana Recipe Collection. To roast the squash, preheat oven to 425 degrees Fahrenheit. Cut squash in half tip to tail, scoop out the seeds and goop, and place cut side down on a rimmed baking sheet. Add ½ cup or so of water, and roast for an hour until flesh squeezes easily when your ove-glove'd hand reaches in to check. It's ok if the outer shell looks blackened. Set aside. In a saucepan (I overfilled a 3.5 quart) over medium heat saute onion in butter until softened. Add seasonings and stir until fragrant, about 3 minutes. Stir in roasted squash. Pour in stock, and simmer 15 minutes. Remove from heat, add coconut milk and banana to the pot, and blend with an immersion blender until smooth. Taste--do you need more salt or pepper? Serve warm or at room temperature, and garnish with cashews and/or yogurt if you like. Not surprisingly I love the use of the banana. I can see how it would lend a hint of sweetness while making the soup extra creamy. Well done. I will absolutely be making this, and I'll likely hear your voice in my head while doing so. You are with me in my own head, way more than you probably even realize. I'm sorry my banana is subtle, but I like it that way. I like being in your head--that's pretty cool, you know? Thanks!